Following our first Brainstorming Town Hall, the Awesome Lady Squad (which we’ve starting likening to a real life “Justice League,” fighting against inequality in the world) reconvened to dream up more concrete action plans and flesh out the specifics for a few of the ideas so we can get down to saving – or at least improving – the world, one mission at a time. After reviewing the problems and hopeful visions the group had listed at the last meeting, we dove right into an idea generation exercise. 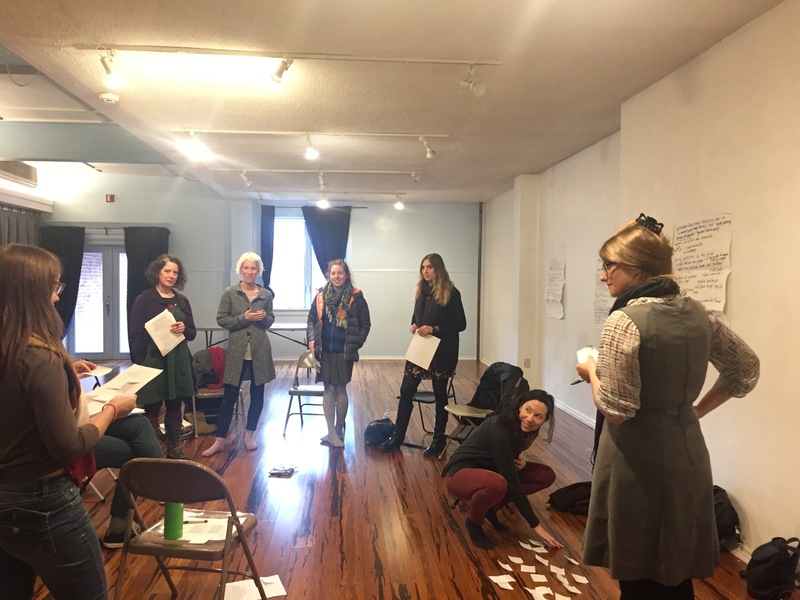 We each took a stack of post-its and spent fifteen minutes dreaming up projects or creative solutions to tackle specific issues or problems relating to inequity we see in the world. When we finished, all the ideas were briefly pitched and grouped into similar projects, eventually developing an inspiring web of proposals. Click here to download a list of all our ideas. Then, we all took another look at what we’d generated. Adrienne asked a few ladies to self-nominate as “mission leaders” to develop a project they were drawn to. These volunteers were joined by others interested in working on the same project. Thus divided into four groups, we set to work. Each team received this Mission Task Sheet, which features a series of questions to guide each group in thinking about the practical requirements of implementing the project proposal and the “superpowers” required of team members to most successfully conquer a mission. You’re welcome to download a copy at that link and fill it out for any project you’ve been thinking about but aren’t quite sure how to begin working on. These projects are in varying states of action/interest in further development, but if you’re interested in learning more and/or volunteering to lead/participate any of these missions, email swimponypa@gmail.com. Likewise, if you want to lead a different mission and are looking for volunteers to help, let us know and we’ll help you get the word out. Beyond that, the Awesome Lady Squad will be gathering again January 5, 7-9 PM at the front studio at Headlong, to continue this work. Join us!